Hi, I’m Jenn! I’m a designer by day, and at night, I’m a blogger here at Hello Rigby where I indulge in my true passions: fashion, beauty, and everything in between. 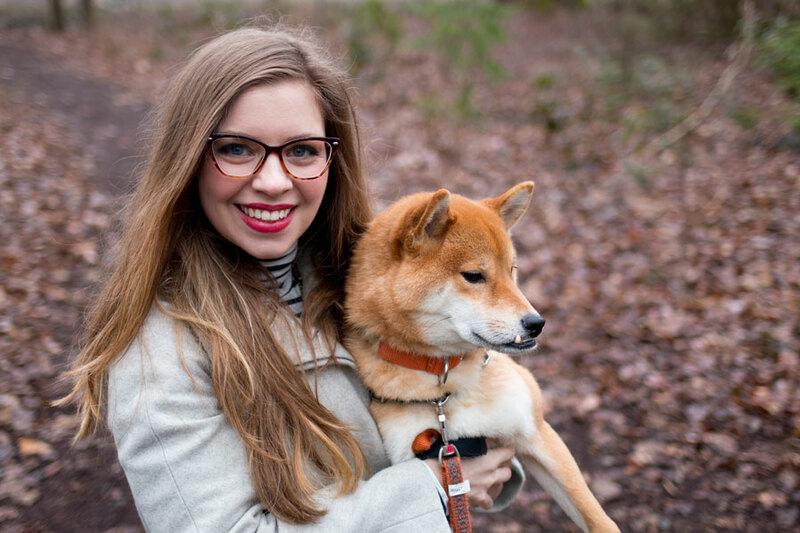 I love to write about what I’ve been wearing, the namesake of this blog, my four-year-old Shiba Inu, Rigby, what’s new in my makeup collection, and all the other beautiful things in life. So who is Jenn anyways? …Well, tell us more about Rigby! Rigby is a year-and-a-half four-year-old Shiba Inu. (My little boy is growing up!) He also has a silly little underbite, which meant he was rejected from having a future as a show dog. Their loss, my gain. ;) If you’re new to Shibas, no they are not foxes, coyotes, or wolves. Shibas are a quirky little Japanese dog breed. When he was tiny, and I took him everywhere, I got a bit sick of “OMG IS THAT A FOX DOG? !” No. He is not a fox, I promise. If you want to read more about Rigby, I highly recommend checking out all of the posts I’ve written about him here. Wait, why did you name your dog Rigby? Like… Rugby? Wait, so you have a dog, and you have a blog… who takes your photos? Hopefully, that answers any questions you had about me. If you want to know anything else, leave me a comment below or shoot me a message anytime. oh that’s funny! i’m glad i could clear things up for you! :) i grew up in mukilteo, what a small world! my mom also had a quilt shop in snohomish for many years, so i’m familiar with that area too! :) “ux” stands for user experience, and i design interactions and experiences for mobile apps and websites! i’ll update that to make it more clear… sometimes us “techies” forget that not everyone lives in our world, haha. Hi, so nice to meet you! Your intro reeled me in right away: dogs, fashion, books and saracasm? We are practically blogging soul mates! Thanks for finding me so I could find you. I’m excited to get to know you, Rigby and your blog better! I love that your pup is named Rigby too! We had to go with the full name because explaining that she was a girl got tiring but it’s nice to see that great minds do think a like even if they’re on opposite sides of the country (Do ppl sometimes call her “Rigsby?” That’s been another headache on our end ha haha). Well in any case, great blog, great dog, and looking to some great posts in the near future. Take it easy! I don’t know how I could have even handled meeting Sarah Jessica Parker! I probably would have just stared at her for a little bit and screamed, “OH MY GOD. YOU’RE REAL!” Anyways! I’m so glad I found myself here! I found your blog on Twitter through a Retweet which had one of your posts linked. You seem like so much fun! And, you live in Seattle which is my second home. I’ll be visiting my best friend there in a couple of weeks. So excited! Your dog is adorable! I’ve never heard of that breed, but now I want one! To be honest I’m not sure you can even get Shibas in Germany. I’d have to look into it. I really want some kind of dog though! I’m Somer and I wanted to let you know how much I love your blog! I live on the east coast and going to Seattle is definitely on my bucket list. It seems like such a cool place with an incredible vibe. I just wanted to say hello and invite you to visit my newly launched blog. It would mean so much to me if you would stop by! I’d love for you to check it out and tell me what you think! Love your blog and your adorable dog!! Aw, thank you Beth! Of course I have recommendations. :) I’m going to email you right now with a couple of questions! Rigby is adorable. I understand your love of your dog! I have a 15 year old Shiba Inu named Tabitha! Aw, thanks! And senior Shibas are the best! I hope Rigby lives a very long life like Tabitha. Thanks for stopping by Susanna! Hi! We’ve somehow found each other and I’m finally browsing your blog with more time on my hands and I love it! And I love Shiba inus, they’re so cute!!! I think the name is pretty fantastic as well! Can’t wait to read more! And hope you’re having fab time in Europe, love it there! Lived there for many a years! My husband takes my outfit photos for my blog and hates it too. He is also a web developer and helps me with my WordPress. We have a lot in common. Aw, thanks Asa! Glad you enjoyed it, and it does sound like we have a lot in common! Hopefully your husband will come around, but I must admit, Dave still rolls his eyes whenever I ask almost 2 years later. ;) Let me know if you ever want to connect for coffee or HH since we’re both in the Seattle area! Hi Jenn. I am just now seeing your response to my comment. I was on your site and thought I would just check. I would love to meet for coffee sometime. I will shoot you an email. Aw, thank you so much Victoria! That underbite on your dog is quite literally the cutest thing ever! Your blog is adorable, I can’t wait to follow along! And I can’t believe you almost named your dog Veruca Salt, that’s too funny!! Aw thanks Sydney! So happy you found me. I’ll be checking your blog out too! Hey, just got an email from about.me this morning (Indonesia, south-east Asia) .. Love this site, wonderful and awesome!!! What a beautiful blog. I’m from Washington too. I can’t wait to explore more of your posts. This confuses me because I haven’t changed anything and I am still getting emails from other WordPress blogs and can successfully subscribe to other WordPress blogs. I would love any help/input if you can offer any. Thanks so much. Hi Christy! So sorry about that. I have no idea what might be causing that, as I have you listed as actively receiving emails. (It omits those who have not confirmed their subscription or those who have unsubscribed.) It may be because the plugin I use was out of date, and I’ve just updated so fingers crossed they will start coming again!